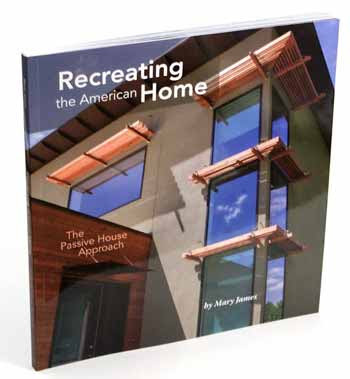 I realized that I never shared some great news from this past fall, which is that our home is one of 10 featured in a new book called "Recreating the American Home: The Passive House Approach." The book features Passive Houses from across the country, and it's interesting to see the details of each project and how they differ depending on their location and climate. The book is available through Low Carbon Productions. The author later did a follow-up interview with me about what it's been like living in the Passive House. She recently posted the interview on her blog: www.lowcarbonproductions.com/2011/02/interview-sarah-evans-passive-house-owner-salem-oregon. I would like to clarify something I said in the blog interview. We never turn off our ventilator, ever. What we did at night during the summer was turn off the heat recovery portion. So instead of recovering heat from our inside air before sending it to the outside, we let it ventilate out and let the cooler outside air ventilate in, without any heat exchange.